In this Article you will find the Importance of Sitemaps in the field of Search Engine Optimization and will find a simple way to make a HTML Sitemap in WordPress CMS. In website Search Engine Optimization, the sitemaps are very important. They are the one of the first steps to take when doing SEO. They can help you to rapidly boost your website traffic without any money. So you can get a lot of traffic without spending a single penny. Before learning the process, first one should be clear about, "What are sitemaps?" The sitemap of a site is simply a page which provides an overview of that website and have almost all links of the site. It may be XML or HTML. The XML sitemaps are used by search engine bots or spiders to crawl the data of the website. They are not readable by readers or human beings that is human beings can't understand them. Therefore they are of no use for readers. If you open an XML sitemap then you'll see a lot of coding, which you can't understand. Whereas the HTML sitemaps are in language HTML. They are readable and understandable by human beings. Search bots may not use them to crawl your site, but it doesn't mean that they are of no use. They provides a lot of information about your website to your readers. These are two types of sitemaps. Most of bloggers and site owners knows the importance of XML sitemaps and therefore they have XML sitemaps of their websites. But they often ignore the second one that is HTML Sitemap. HTML sitemap is of great importance, if you want better traffic and better page rank then you must have an HTML sitemap for your website. In most of the websites you may see a widget like "Archives". This is basically an HTML sitemap. This includes all links to all posts. With this you can browse the content of a blog very efficiently. It makes easy to find desired information. So this is good for your website or blog to have an HTML sitemap which provides the information according to the dates. 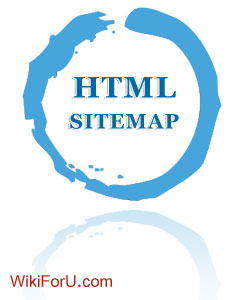 In many CMS's you may already provided with an HTML sitemap. But in case if your blog's Content Management System does not provides it then don't worry. Here is a simple tutorial for Wordpress users to create an HTML sitemap in just a couple of minutes. In this method we generally uses a plugin for WordPress, which lets you create the HTML sitemap of your blogs by following simple steps. The name of the plugin is SRG Clean Archives. First of all Download Clean Archives. Read this file carefully: Readme.txt. This is included in the Download package of plugin. This file includes all required information about uploading and installing this plugin. Upload it to WordPress and Install it. Now follow the instructions and thats all. Please feel free to comment here if you have any problem in installing it or if you don't know how to install a plugin. Now HTML sitemap for your blog has been created.